The effectiveness of escape holes in whelk pots and riddles in reducing undersized whelks was studied in collaboration with Cefas and Sussex IFCA between June and November 2012. Fifty experimental whelk pots with varying sizes of escape holes and a variety of riddle sizes, both ranging from 20 to 28 mm, were tested at four sites in the Kent and Essex and Sussex IFCA districts. Commercial fishing vessels were chartered to set and haul the pots. It was found that escape holes in whelk pots are the best method for reducing undersized whelks caught. Following consultation with the fishing industry, this information was used to inform a new flexible permit byelaw. A full survey report is available here. 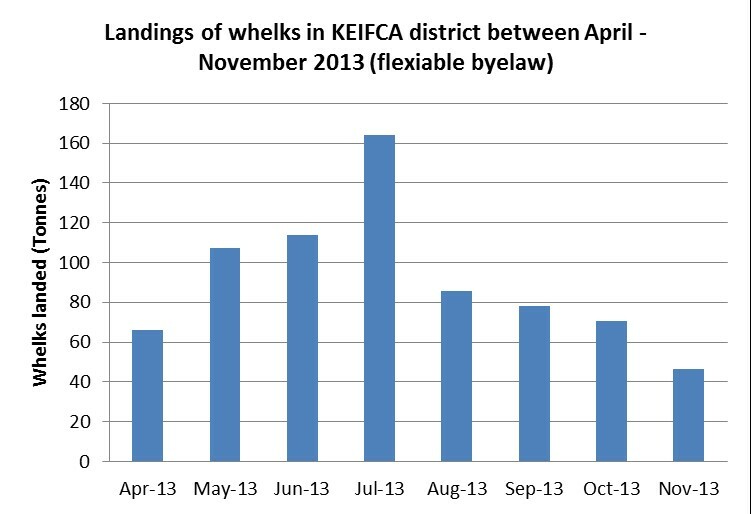 A condition of the whelk byelaw is that permit holders must submit details of the number of whelk pots used, the location, time soaked and amount caught to K&EIFCA on a monthly basis. This information is analysed regularly to assess various parameters including the catch per unit effort and the total amount caught.